Once again we see here an example of the increasingly popular (and completely WRONG!) trend of personalizing one of the external ornaments, in this case, with the addition of the triquetra on the episcopal cross (erroneously referred to as a “processional” cross in the description) to represent the Holy Trinity because it was the name of the seminary the bishop attended. It is necessary to repeat that the only thing subject to having charges particular to the bearer is the shield. The external ornaments may NOT be personalized in a heraldic achievement of this type and all those who advocate such a practice are both incorrect and foolish! The heraldic artist is completely free, in future, to depict this bishop’s coat of arms with an episcopal cross of any shape and manner he might wish. This is what happens when armigers turn to those who do not know what they are doing for the devisal of their coats of arms. This entry was posted in Bad Heraldry, Bishops, External Ornaments, Heraldic Mistakes, Work of Other Artists on February 11, 2016 by guyselvester. 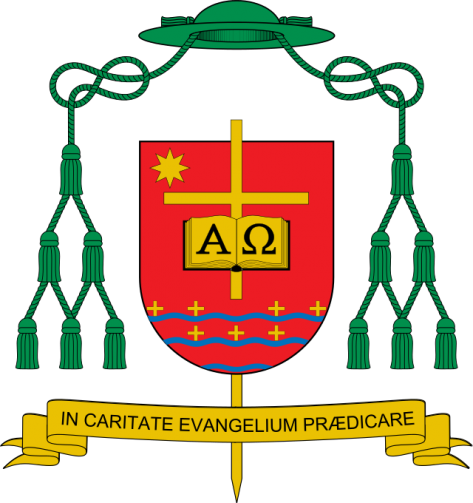 The coat of arms of the new bishop of São Mateus, Brazil, the Most Rev. Paolo Bosi Dal’Bo. The inclusion of the pastoral staff (crozier) and mitre is incorrect. The directives of Bl. Paul VI indicate these should not be included in the coat of arms of a bishop. This entry was posted in Bad Heraldry, Bishops, External Ornaments, Heraldic Mistakes on December 14, 2015 by guyselvester. This entry was posted in Bad Heraldry, Cardinals on November 14, 2015 by guyselvester. On November 9, 2015 His Holiness, Pope Francis ordained the Most Reverend Angelo De Donatis as Auxiliary Bishop of Rome. His somewhat disappointing coat of arms can be seen below. This entry was posted in Bad Heraldry, Bishops on November 14, 2015 by guyselvester. Today Bishop Fernand Cheri, OFM was ordained as the auxiliary bishop of New Orleans, Louisiana. His coat of arms has so many things about it that go against accepted heraldic practices, to say nothing of good taste, that I won’t even begin to comment on it. This entry was posted in Bad Heraldry, Bishops on March 23, 2015 by guyselvester. On March 3, the Most Rev. Daniel Elias Garcia was ordained as Titular Bishop of Capsus and Auxiliary Bishop of Austin, Texas. 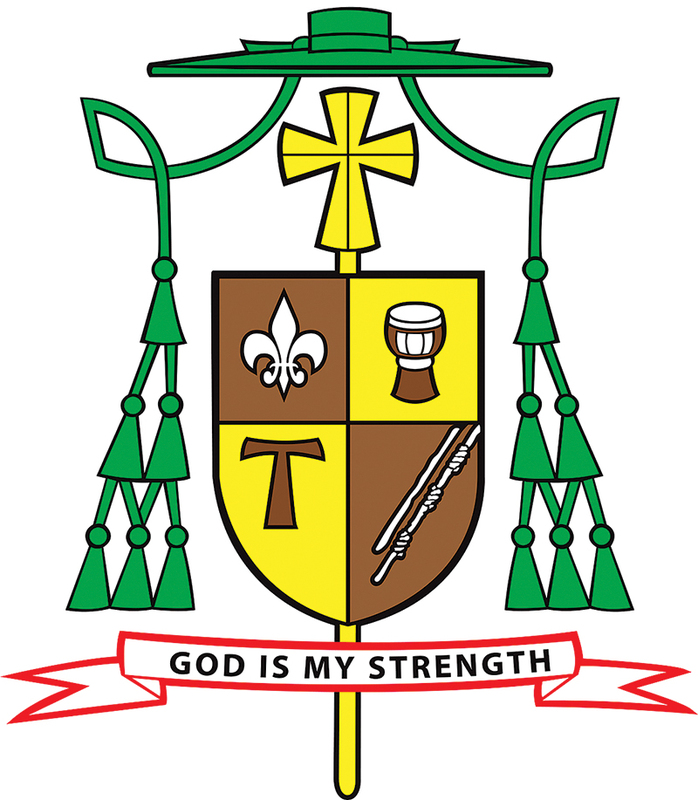 His adopted coat of arms (below) depicts his devotion to Our Lady (the roses), baptism (the shell), the Colorado River and Christ who is the First and the Last. Dividing the field into two colors (green and gold) by a blue line isn’t really the best design choice. It would have been better if the whole field were gold. In addition, the description of the arms from the ordination program describes the “processional cross” as being in the form of a Jerusalem cross for apparently no reason. First of all it is not a processional cross. The external ornament in a bishop’s coat of arms more than any other that marks it as the coat of arms of a bishop (even more than a mitre or a galero) is the episcopal cross that stands vertically behind the shield. This type of cross, which resembles a processional cross, used to be carried directly in front of a bishop. Like the galero, also no longer in use, such episcopal crosses are no longer used but are retained as not only one of but actually as THE ensign of the coat of arms of a bishop. The galero is optional; the cross isn’t. Second, it is not permitted to mandate that an external ornament like the episcopal cross, be depicted in a certain shape or style. The blazon concerns itself only with what is on the shield. That may indeed be mandated to be depicted in a particular way. No other artist is bound to depict the episcopal cross of Bp. Garcia’s arms as a Jerusalem cross. It may be his preference but it is not one to which others must adhere. This entry was posted in Bad Heraldry, Bishops, Work of Other Artists on March 11, 2015 by guyselvester. 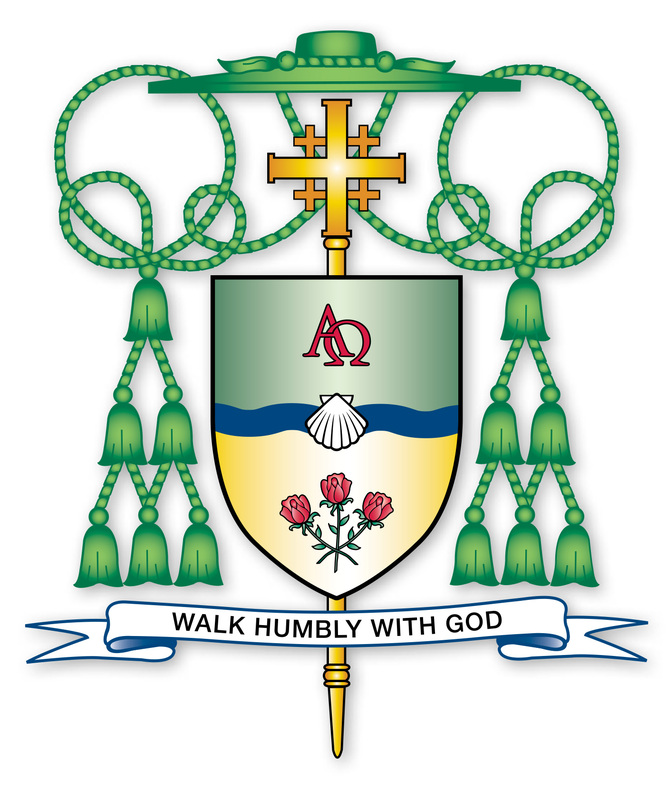 Above is the coat of arms of Jan Piotrowski who will be installed on November 29 as the Bishop of Kielce, Poland. The bishop’s arms contain perfectly good charges and are arranged nicely with good composition with one exception. The episcopal cross (often mistakenly thought of as a processional cross) which is the one external ornament that indicates the arms belong to a bishop, since other prelates may use the green galero with 12 tassels, is depicted as passing in front of the shield and piercing it with the bottom of the cross protruding from behind the shield. It is as if the cross is depicted as both a charge on the field and an external ornament at the same time. This is most incorrect. Charges must never extend beyond the edges of the shield; external ornaments should not be placed in a position to obscure any of the shield; objects cannot be depicted as piercing the shield; external ornaments are to be just that: external to the shield. I’m sure the person who designed this and/or depicted it thought he was being very clever and innovative. Instead, it’s just wrong. EPIC FAIL. This entry was posted in Bad Heraldry, Bishops, External Ornaments on November 28, 2014 by guyselvester.